The president is also the supreme commander of all the three armed forces - the Indian Army, Indian Air Force, and the Indian Navy. The president was accompanied by Defence Minister Nirmala Sitharaman and three services' chiefs. 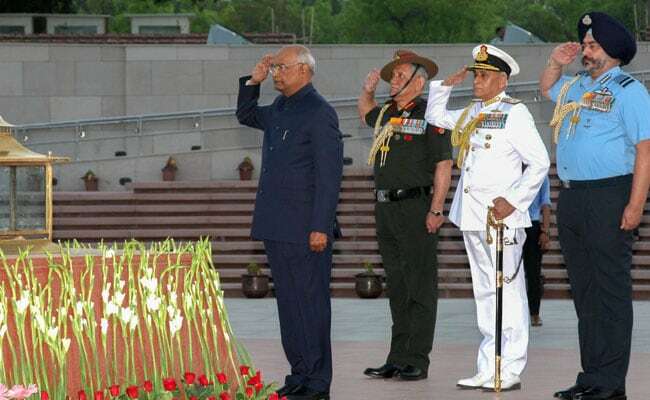 President Ram Nath Kovind Monday paid a visit to the National War Memorial in New Delhi, his first to the newly-built iconic landmark, to pay homage to the country''s fallen heroes, officials said. He was accompanied by Defence Minister Nirmala Sitharaman and three services' chiefs. "President Kovind laid a wreath during his visit to memorial to pay tribute to the martyrs. This was his first visit to the National War Memorial," a senior official said. Chief of Army Staff Gen Bipin Rawat, Chief of the Naval Staff Admiral Sunil Lanba and Chief of the Air Staff Air Chief Marshal B S Dhanoa were present on the occasion, he said. Prime Minister Narendra Modi on February 25 had inaugurated the country's National War Memorial adjoining the iconic India Gate complex in the heart of the capital, nearly 60 years after it was mooted to honour the fallen soldiers after Independence. Spread over an area of approximately 40 acres, the memorial comprises four concentric circles, namely -- the ''Amar Chakra, Veerta Chakra, ''Tyag Chakra'' and the ''Rakshak Chakra'' with names of 25,942 soldiers inscribed in golden letters on granite tablets.